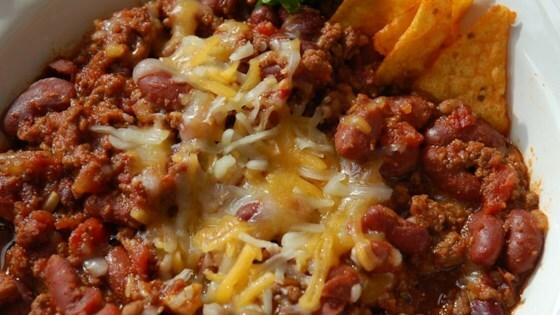 "Every time I make this chili, people beg for the recipe. My husband wants this made at least once a month. It is delicious topped with shredded Cheddar cheese and sour cream." Place the ground beef in a large pot and cook over medium heat until evenly brown. Drain off the excess fat. Mix in the kidney beans, diced tomatoes, beer, chili sauce, onion, garlic, chili seasoning, black pepper, garlic powder, onion, cayenne pepper, oregano, sugar, hot sauce, and Worcestershire sauce. Bring to a boil. Reduce heat to low, and simmer for about 4 hours, stirring occasionally. This chilli is absolutely stunning- I'm not surprised people beg for the recipe! great recipe! took 2nd at the chili cook off at work... i only put in half of the sugar though and it was plenty for me and added some extra cayenne pepper and chili powder for extra kick.. This is very tasty chili, not chili! It is a little sweet, but also has a little zing. I used it on baked potatoes and it was a big hit at our house.